Development and Trainings - D.M.A.T. In addition to the projects where the D.M.A.T. Consulting KG acts as a partner, it also takes on orders as a subcontractor. The activity of D.M.A.T. Consulting KG is based on experience in numerous humanitarian and civil defense assignments, training and runs its own projects, mostly developing solutions, tools, strategies and processes. As part of the cycle of EU module exercises (ModEx) for 2017/2018, 5 module exercises had been carried out in Great Britain, Denmark, Bulgaria, Austria and France. The first ModEx took place in October 2017 in England. This was followed by exercises in Denmark in January 2018 and Bulgaria in March 2018. Read more about the structure and procedure of the already completed module exercises. In May 2018 ModEx (Modular Exercise) was held in Austria, on Erzberg in Styria. The D.M.A.T. Consulting KG was entrusted by the Province of Styria for planning of this exercise. The ModEx Austria took place in the international training center of the Styrian Red Cross for “Urban Search and Rescue in alpine terrain”. The D.M.A.T. Consulting KG was pleased to announce the exciting and challenging tasks of planning and implementing a 36-hours exercise for the training of two medium urban search and rescue teams from Greece and Lithuania, a Cave Rescue Team from Slovenia and a drone team from France. This work was in cooperation and carried out on behalf of the State of Styria, Department of Civil Protection and National Defense as a partner in the ModEx 2017-2018 consortium, involving Styrian rescue organizations, which was in Eisenerz. The European Technical Assistance and Support Cooperation project will train smaller teams to help European field disaster assessment and coordination experts in the field. This project was co-financed by the EU (Preparatory Action in 2008), Johanniter from Germany and the Cypriot civil protection were the Project manager and D.M.A.T’s clients. The EUTAC project was co-funded by the European Commission in Civil and Civil Protection Mechanisms, Preparatory Work in 2008. Between May 27th and 30th 2010, an exercise in European technical support cooperation take place in the southern part of Styria and the northern part of Slovenia. The aim of this exercise is to train and test the European technical assistance team to assist the European civil protection departments when major catastrophes happen. Exercise for the technical support of European aid organizations. At the end of May in 2010 at the international exercise in southern Styria, Austria, two multinational Technical Assistance Support Teams (TAST), Johanniter from Germany and the Cyprus Civil Defense, were not only trained but also been put to the test. One of the objectives that required in this project has been audited in southern Styria, is the support of a European civil protection team in the area of ​​action. These include the creation and operation of an On-Site Operation Coordination Center (OSOCC), IT support, catering and care for the teams, as well as accommodation and transport. The exercise also included explorations along the Austrian-Slovenian border, as well as a meeting with the Slovenian Civil Defense. The exercise was overseen by international observers from the civil defense sector. In total, representatives from 10 nations were present at the exercise. Once this exercise has been successfully completed, the trained teams can now be deployed worldwide to support European aid organizations. The EURETS project, European Emergency Temporary Shelter, was co-funded by the EU as part of the Preparatory Action in 2009, it is training a Camp managent emergency response shelter team. The euramet project aims to develop, build and implement a multinational and immediate deployable short-term medical assistance team to evacuate middle and lightly injured people. The development of these medical air evacuation teams the European Air Medical Evacuation, already been co-funded by the European Union in the Preparatory Action in 2009. The coordinator of the project is Johanniter-Unfall-Hilfe e.V. and the associating partners are: the Austrian Worker, the Slovak Republic of Workers’ and the Styrian Provincial Government (Landesregierung). A medical support team consists of 14 people including an advance team, which explores the situation in advance. In addition to creating a basic concept, assistant is trained for these special missions. The European Space Agency ESA is the Principal of the BEATLES project. BEATLES, BGAN enhanced Alphasat Technology and L-Band Extended Spectrum, it aims to enhance visual communication through mobile satellite systems. Sending and receiving messages should be faster, cheaper and more efficient and easier to access. Information about the European Space Agency ESA can be found on their website. 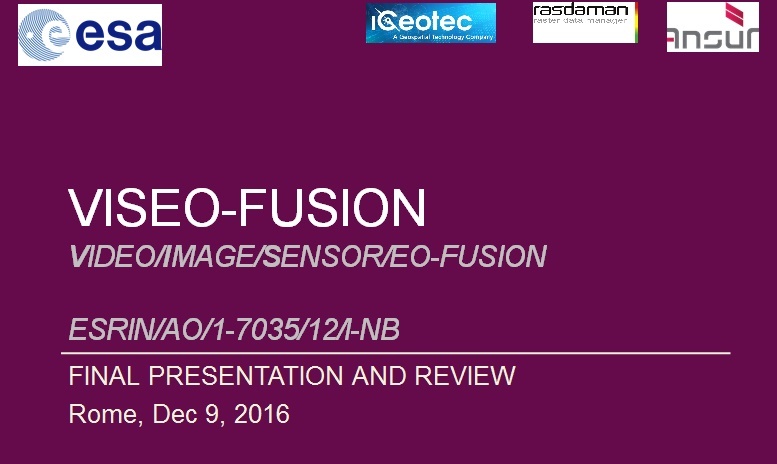 More about the work in the context of technologies around Alphasat can be found here. 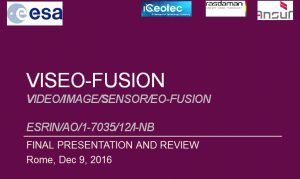 EO VISEO FUSION is an earth observation project dealing with the transmission of video-photo-sensors-earth observation which helps with the Development and testing of “multi-stream geospatial” data platforms.